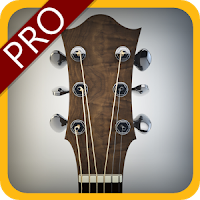 Guitar Tutor Pro is a high quality guitar teacher, custom designed for Android devices, with the first, to give you easy-to-read access to your favorite chords and tabs - on the go. Over 600 Riffs and Songs to learn from different eras and genres. Choose between Classical or Electric Guitar (clean / distortion). Play Chords or Solo with support to improvise in any key. 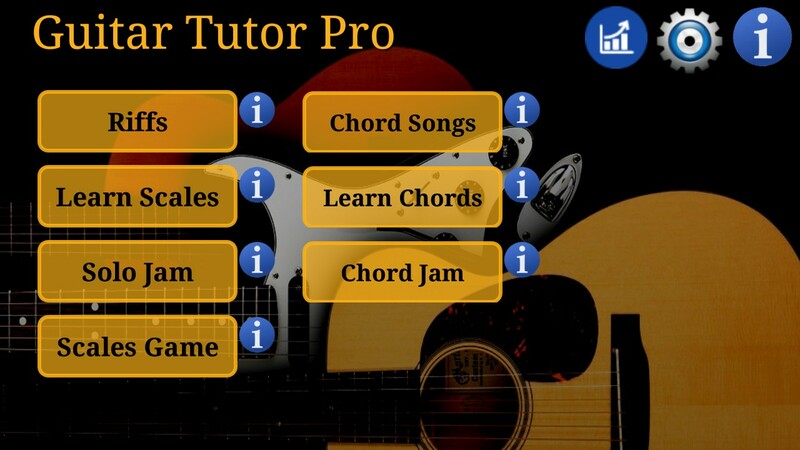 Learn Scales, Chords and Modes in any position. Exercises to test your knowledge. Support for left handed players. Listen and play back. Start with a few notes then build up. A reference to look up any scale in any key. Practice by play and repeat. Test your knowledge of scales. Choose a level, or decide which scales to be tested on. See how you are progressing over time. A reference to look up any chord in any key. Follow the recommended chords to play the songs. Switch between open and bar chords and learn the chords on the fretboard. Select the scale or mode in which you wish to solo in. This will highlight all the right notes within the selected key on the whole fretboard. Then jam to it by aiming to play from the highlighted keys. You'll be surprised how good you'll sound just by hitting a few of the right notes! Play to a click and choose different percussion as backing. Play to a backing track.